Elmo - I'm sure your going to make alot of people happy with this recipe - though cholesterol levels are going to jump!!! No doubt! Anything with a mayo-based has got to be bad for you...but what isn't nowadays. Mus be a filipino thing. My mom does the EXACT SAME Thing with the fish eggs and mayonaise!!!!! Well, unless its a Japanese thing...but she doesn't eat sushi or go get Mussels Dynamite at Japanese restaruants! Yeah, I have no idea if it's uniquely Japanese either...definitely Japanese ingredients, but it may be one of those things invented in the sushi bars of America. Elmo, this post is (two snaps) DY-NO-MITE!!! Funny stuff. Thanks Eddie! Your compliment means a lot! thanks for the pictures & info re 99Ranch market. We are probably neighbors - I live near Trader Joe's. We've probably been in 99 Ranch at the same time. I live in the boonies of Irvine...Northpark. my sister used to tell me that kewpie mayo is healthy because it's, well, japanese. i totally believed her as i gobbled up all those dynamites, california rolls, and spicy tuna rolls that have mayo. LOL! Totally feels healthier doesn't it?! Somehow also the fact that is baked makes it also feel like it's healthier (see it's not fried! )...living in a dreamworld is so much fun! May I suggest giving it a shot with Chili Garlic Sauce as opposed to Sriracha? Personally I think it makes for a slightly better flavoring since it's not a puree but YMMV. Oh, great site btw! I agree with Jim here, it is much better this way. Also, add a tiny slice of jalapeno and a squeeze of lemon at the end for the best possible mussels you can dream of. I agree with Jay (oops) here, it is much better this way. Also, add a tiny slice of jalapeno and a squeeze of lemon at the end for the best possible mussels you can dream of. i really want to try to bake this for my husband. 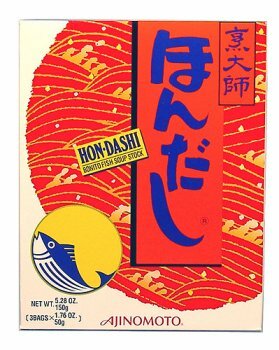 where could i buy hondashi pellets? Hondashi pellets can be bought in any Asian store. It's usually in the area with the soup stock or Japanese items. But really, the two essential ingredients are the Kewpie Mayo (I don't think regular Miracle Whip will work) and the Sriracha. In fact, one day, that was all that I had in my fridge, and I mixed it up, plopped it down on the mussels and it tasted just as good! hi. i have made this recipe before through my own experimentation. If you're in the Southern California area, Korean Super markets and Japanese Super markets will sell Kewpie in plastic squeeze bottles. It has a baby on the bottle as a logo. Freshia and Mitsuwa have them. The two essential ingredients are really just the Kewpie mayo and Sriracha. Everything else is actually optional. I've gotten too lazy and just made them with those two ingredients and it turned out quite well! Baked mussels are the bomb! I've tried asking for them at many sushi restaurants and many don't serve them, when they do,they chop up the meat which allows it to lose flavor. 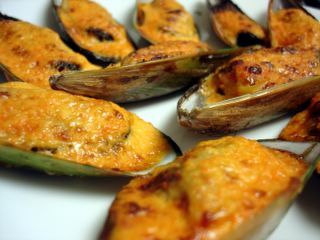 My favorite baked mussels are found at Ariake's restaurant in San Jose. You couldn't be more right about the sauce on the foil...I lick it up! Actually your recipe is better. I've since found that the half and half and the hon dashi isn't really required. All you need is what you showed in your video, Sriracha, Kewpie and Masago. I just made these yesterday with a friend and OMG they were so good. This is both a our favorite items to get when we go out to sushi. i do have one question. if i were to make a big batch of the mayo sauce, how long does it last in the fridge with the fish eggs in it? If you can't find Kewpie mayo, this is a substitute which works out great to. Use regular mayo and add about 1-2 TB of seasoned rice vinegar. Another thing you can add as a garnish is nori strands. Just take a sheet of nori, fold it up a couple of times and cut out thin strands about an inch long over the seasoned mussels. Then bake. Does adding Sriracha make this dish spicy? And if it does... how spicy? My kids love baked mussels from the Japanese restaurants and I thought I'd try this recipe... but I don't know if they'll eat it if it's spicy. 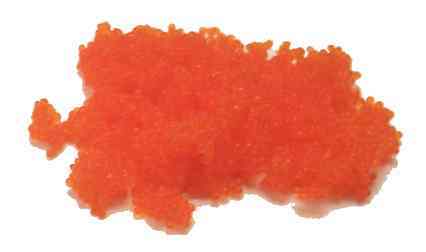 Masago should be kept frozen unless used within a couple of days. I would not premix. I absolutely LOVE your recipe, except I made it with just seven mussels (I had a big plastic container than had about 2 dozen). I made the dynamite sauce, then just topped the mussels all the way to the edge of the shell. I couldn't taste the hon dashi pellets when I made the mixture of hon dashi and half & half, so I put in many dashes of hon dashi. I also added three hearty squirts of the siracha hot sauce. I also sprinkled some suger ontop so there's some carmelization. SO DELICIOUS! Tastes like the baked mussels at this japanese restaurant close to my old work. Nowdays, it's too far for me to drive all the way there for baked mussels. Thank you!!! "I have no idea why this dish has the word "dynamite" in it." I just discovered your blog through a search engine while searching for a Baked Mussels in Dynamite Sauce recipe. I know you wrote this years ago, but I still just want to say "Thank you!" does anybody know where I can get KEWPIE MAYO, I live in SAN JOSE by Milpitas CALI. If you stay in Oahu, you can find "kewpie" mayonaise at most Asian supermarkets- Pacific SuperMarket in Waipahu, Star Markets, Military Commissaries, Marukai Supermarket, Don Quiote Markets, etc.. You can always ask the store employees if they carry "Japanese Mayonaise".. **Also, the Hon Dashi pellets are not necessary as they are meat enhancers also referred to as "MSG". Mussels in Dynamite Sauce recipe is actually from here. Um no, this is my recipe. I wrote this and it's an original. That site you mention STOLE it from me. I'm going to have words with them. I made this for dinner and it's was dynamite! Just like at sushi restaurants but waaaay better! Sweet and juicy mussels with that sweet and creamy mayo. Yummers! Next time I'm going to add some finely chopped green onion to the mayo mix for a bit of added freshness and/or lemon zest. So good and economical. One big box had almost 40 in there so I made half for dinner with my hubby. I served it with cold soba noodles and agadashi tofu. Came out to be less than 8 bucks for two people for such a yummy meal! Thank u so much for the recipe and inspirational derivatives! I buy mussles which are frosen in Market99. These are already open and sold by halfs. I put them on baking sheet, put lemon juce into each shell (about 3 drops per each). here is my dressing: Vegenaise + Russian adjika(gives red color and spicyness) and put one tea spoon into each shell. preheat oven up to 350 degrees. Put mussles into it and keep it for 15 minutes. Ready to eat and melting in the mouse. O, proportion of veganaise and russian adjika, has to be mixed to your taste. Put adjika a little bit into vegenaise and try it. Then increase it's amount until you want it very hot. add a drop of sesame oil and a dash of powdered sugar to the mayo, you'll be surprised at how close it gets to your sushi bar gl mussels!The only thing missing is the base sauce before the mayo...its a wakame/soy/mirin mixture!